* Legally remove DRM protection from iTunes movies or TV-shows, BD/DVD Digital Copies, Amazon Instant Video, BBC iPlayer, etc. Get rid of DRM-protected “Digital Copy” movies that bundled with recent DVD or Blu-ray titles. 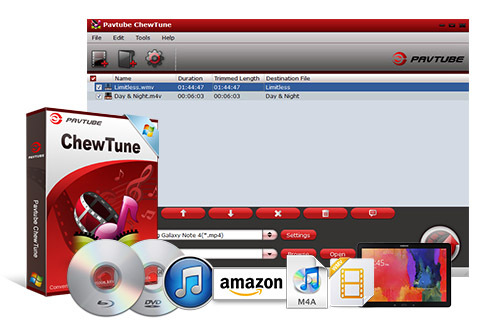 There are a great number of output formats in Pavtube Chewtune’s output format list, and sure that you can find a proper one to which you can convert your DRM-protected videos. You can convert your DRM-protected videos for playback on devices like iPhones, iPads, iPod Touch, Android tablets and smartphones, Windows devices, game consoles, HD media players, etc. You can also import the DRM-protected videos to video editing programs like Adobe Premiere, Sony Vegas, Avid Media Composer, etc. The “Profile Settings” screen allows you to adjust audio and video settings like size, bitrate, frame rate, sample rate, channels, etc. To save time and energy, you can check all the DRM-protected videos to perform batch conversion. You’ll have no problem starting using this DRM protection removal for just several simple clicks can fulfill the conversion. How do I Backup My iTunes Videos for Playing in Many Media Devices? How to Store iTunes DRM Music and Movies on SD Card? How to Transfer and Convert iTunes Video to NAS for Sharing? Do I have any chance to play iTunes M4V movies on PS4 freely?